LaDainian Tomlinson, normally called with his initials L.T., was born in Rosebud, Texas USA on 23 June 1979, to mother Loreane Chappelle and father Oliver Tomlinson. He is a professional football player, a famous running back in the National Football League(NFL). His parents divorced in 1986 and his father left the family. However, despite growing up without him, L.T. once reported that his interest in football was inspired by the time he spent with his father watching football games on television. So just how much is L.T.’s net worth? Sources state that the successful running back has acquired a wealth of $32 million, accumulated during his carrier as a professional football player. Signing a six-year $38 million contract with the San Diego Chargers transformed L.T.’s life overnight. He bought new homes in Dallas for his mother and his sister, and also two buildings for his mother’s real estate business and his sister’s day-care center. For himself he bought a new car and rented a condominium in San Diego. During his huge success within the NFL he bought 13-acre property for $3.5 million, and spent an additional $1.5 million to combine two parcels and add features to the house. The property was sold in 2014 for $3.495 million. In 2007 he bought a waterfront home in Lakeway, Texas, which was sold for $1.46 million last year. L.T.’s school years in the field were a sign of the things to come. He attended high school in Waco, Texas earning second-team all-state honors and later he chose to attend Texas Christian University (TCU) in nearby Fort Worth on a scholarship, where he became collegiate football’s leading rusher playing for TCU Horned Frogs. In 2001, the San Diego Chargers selected L.T. as a fifth overall pick in the first round of the NFL draft. Out of total 11 seasons, in each of the first seven he was gaining more than 1,200 rushing yards and taking more than 50 pass receptions. His tough running style as well as his unbelievable speed on the field enabled him to achieve huge success, and become the only NFL player ever to rush for 1,000 yards and catch 100 passes in a single season in 2003. The following year he was ranked second in the NFL with 18 touchdowns. In 2005 L.T. became the seventh player in NFL history to run, catch, and throw for a touchdown in the same game and ranked third in the NFL with 20 touchdowns. 2006 was his most successful year when he led the league in rushing yards, reaching another milestone by becoming the fastest player ever to score 100 touchdowns. Following this was his breaking of a 46-year-old record for most single-season points scored (186), and L.T. was selected as the NFL’s Most Valuable Player for the 2006 season. Of course his notional value was increased by these achievements. Setting several touchdown scoring records brought the player various honors and awards among which the selection to five Pro Bowls, being an All-Pro six times; the Associated Press awarded him their Offensive Player of the Year Award and later he was named NBC Player of the Year. His numbers haven’t declined over the following seasons – in 2007 he was ranked first in the NFL with 1,474 rushing yard and second with 18 touchdowns. He helped the Chargers advance to the American Football Conference championship game in 2008. However, his success changed in the next two seasons when he suffered several injuries and after full nine seasons with Chargers he was released by San Diego in 2010, signing a free-agent $5.2 million contract with the New York Jets. His career with the Jets lasted for two seasons and he retired in 2012 signing a ceremonial one-day contract with the Chargers with 162 career touchdowns – the third highest total in NFL history at the time he retired. In 2012, “First on the Field” signed Tomlinson as an analyst for the NFL Network’s Sunday morning show. The following year he became the host and a judge to decide the “Top 5 Running backs” from each week’s games. In L.T.’s personal life, in 2000 he reconnected with his father and thereafter they enjoyed a great relationship. In 2003 he married LaTorsha Oakley who he started dating at college. However, not everything was positive in player’s life. After his brother was killed in a street fight during their childhood years, in 2007 his father and brother-in-law died in a car accident, which left the player devastated. Three years later L.T.’s son was born and the player reported this as his rebirth. Only a year after, their family expanded with the birth of a daughter. One of the top running backs of 2000 L.T. ended his brilliant 11-year NFL career the same way he started it – with the San Diego Chargers, saying that he had opportunities to play elsewhere, but felt that the time was now to move on to the next chapter in his life. 3 Met wife LaTorsha at Texas Christian University (TCU), where they were both students. 4 Father, Oliver Tomlinson, was killed in a road accident resulting from a blown tire in Waco, Texas (February 23, 2007). 5 Every home San Diego Chargers games, he donates tickets to 21 under-privileged kids from his "The 21 Club" attend the game. After the game, he takes the kids out for dinner and a night on the town. At the end of the night, each kid leaves with a goodie bag full of games and school supplies. 6 Oversees the Tomlinson Touching Lives Foundation benefiting under-privileged youths in San Diego and his hometown state of Texas. 7 At the age of 27, many media outlets, including Time Magazine, already began labeling him as possibly the best running back ever. 8 Frequent attendee of Los Angeles Lakers basketball games. 9 Off-the-field hobbies include basketball, golf, and classic cars. He owns a restored 1964, cherry-red Chevy Impala. 10 He was picked 5th overall in the 2001 draft by the San Diego Chargers. 11 Played college football for TCU (Texas Christian University). 12 Along with rookie standout Philip Rivers, he led the Chargers to a first-round bye and a 14-2 regular season record in 2007. 13 Other records he has include most games with over 100 yards in a single season. In the 2006-2007 season, he had over 100 yards in 12 out of 16 regular season games. He also has a record for 14 consecutive games with a touchdown. 14 In the 2006-2007 season, he broke numerous records, most impressively the record for most touchdowns by a single player in a season with 31. The record was previously held by greats Priest Holmes and Marshall Faulk, but most recently had been set by Shaun Alexander the year before, with 28. Not only the record, but he broke the record in the 14th out of 16 games in the regular season. 15 Was named the NFL's MVP in the 2006-2007 season. 16 Considered by many to be one of the classiest and nicest players in the NFL. 17 Some of his prized possessions are his three dogs, and football helmets signed by his heroes Jim Brown, Walter Payton and Barry Sanders. 18 Proceeds from his annual golf tournaments go towards the "LT School is Cool" scholarship fund. 19 Tomlinson is the first person to catch 100 passes and rush for 1000 yards in the same season, which he did in 2003. 20 His first career pass completion was a touchdown to quarterback Drew Brees, on a trick play against the Oakland Raiders on 28 September 2003. 21 He wears uniform number 21 for the Chargers because it is between the uniform numbers of two running backs he idolized while growing up: Barry Sanders (20) and Emmitt Smith (22). 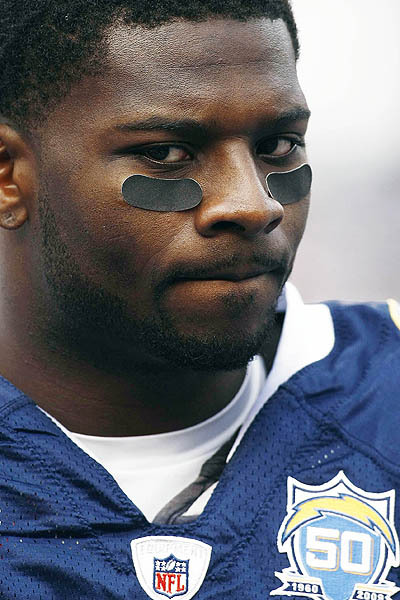 LaDainian Tomlinson: Todd Gurley has a way to go before he reaches my single-season TD record!